Being in the state of best health is probably the most important but also the most overlooked part of our lives. It is a fact that early diagnosis of many a diseases paves the way for their timely treatment. To this end, it is pertinent to go for a complete body checkup once in a while. 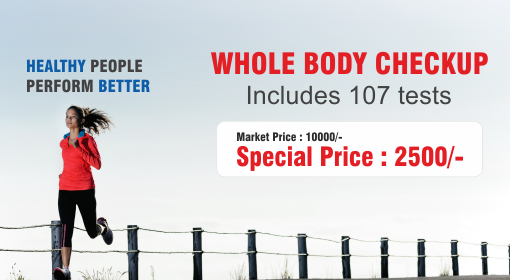 Wellness Pathcare, a leader in its own right in the diagnostic and preventive medical care, provides the facility of whole body checkup at one of the most competitive prices. Our package provides testing of 101 ailments and 10 profiles. The reports for these tests are made available online and can also be delivered to your home. Most of the reports are made available within 24 hours except some which require mandatory testing for a few more days. Our tests allow for heart risk, thyroid, blood-iron, liver, kidneys, blood-sugar levels, arthritis, urine test and blood elements.